The terrorist cell behind the attacks in Spain was planning a series of devastating assaults, potentially including a large-scale truck bomb, investigators revealed yesterday. Police were last night still hunting for one suspect, 22-year-old Younes Abouyaaqoub, involved in the attacks, which left 13 dead in Barcelona and another person dead in the seaside resort of Cambrils after they were ploughed into by a van and car, respectively. Five terrorists were also shot dead by police. Plans for numerous attacks involving explosive gas canisters were only abandoned by the terrorists after the house in which they were being stored was accidentally blown up on Wednesday, police believe. The revelation came as the suspected driver of the van who launched the assault in the Las Ramblas district of Barcelona was named as 17-year-old Moussa Oukabir. Authorities later r evealed he had been one of the five men shot dead during the attack in Cambrils. Police told media that Said Aallaa, 18, and Mohamed Hychami, 24, who they had earlier put on a wanted poster with Oukabir, were among the dead. Two bodies were found in the house that exploded in Alcanar and four men have been arrested. The identities of the victims of the attacks also started to emerge, including a Spanish father run down in front of his partner and young children and Jared Tucker, 43, from San Francisco. The family of Julian Cadman, a seven-year-old British boy who remains missing, launched desperate appeals for information about his whereabouts. The two attacks, launched eight hours apart, injured more than 130 victims from 34 countries. But investigators said the assaults were ârudimentaryâ compared to the original aspirations of a terror cell that had spent months plotting multiple massacres. Josep Lluis Trapero, the head of Cataloniaâs police force, said a group of extremists had been preparing multiple assaults for âsome timeâ before their base was destroyed by a gas explosion that killed one person on Wednesday night. Around 20 bottles of butane were discovered in the ruins of a house in Alcanar, which analysts said could have been loaded into a vehicle and blown up in a ramming attack. A second van found in the town of Vic in Catalonia is also being investigated by police amid reports that the attackers had tried to hire a lorry, which was foiled when the driver failed to produce the necessary permit. The destruction of the gas canisters in Wednesdayâs explosion appears to have disrupted the plot further, rushing jihadis into the unsophisticated attack in Barcelona and a second ramming in Cambrils. Thousands of tourists and locals were packed into the famous La Rambla street when a hi red white van started ploughing into crowds, zig-zagging in a deliberate effort to mow down pedestrians. The driver of the van fled the scene and was shot in Cambrils several hours later during the second assault. Security services are examining forensic evidence, including DNA from terrorists in Spain, France, Germany and the UK to investigate the possibility of links between perpetrators across Europe. No connection has yet been established with the terror attacks that have struck the UK so far this year. As investigators continued to piece together the events of a bloody 24 hours, Barcelonaâs residents gathered at a vigil to remember the victims. Tourists and locals walk along Las Ramblas following yesterday's terrorist attack, on August 18, 2017 in Barcelona, Spain. Thirteen people were killed and dozens injured when a van hit crowds in the Las Ramblas area of Barcelona on Thursday. Spanish police have also killed five suspected terrorists in the town of Cambrils to stop a second terrorist attack. Police officers patrol on Las Ramblas following yesterday's terrorist attack, on August 18, 2017 in Barcelona, Spain. Thirteen people were killed and dozens injured when a van hit crowds in the Las Ramblas area of Barcelona on Thursday. Spanish police have also killed five suspected terrorists in the town of Cambrils to stop a second terrorist attack. Police officers tell members of the public to leave the scene in a street in Barcelona, Spain, Thursday, Aug. 17, 2017. Police in the northern Spanish city of Barcelona say a white van has jumped the sidewalk in the city's historic Las Ramblas district, injuring several people. Injured people react after a van crashed into pedestrians in Las Ramblas, downtown Barcelona, Spain, 17 August 2017. According to initial reports a van crashed into a crowd in Barcelona's famous Placa Catalunya square at Las Ramblas area injuring several. Local media report the van driver ran away, metro and train stations were closed. T he number of people injured and the reasons behind the incident are not yet known. Official sources have not confirmed that the incident is a terrorist attack. A person is stretched out of a mall by medical staff members in a cordoned off area after a van ploughed into the crowd, injuring several persons on the Rambla in Barcelona on August 17, 2017. Polic e in Barcelona said they were dealing with a "terrorist attack" after a vehicle ploughed into a crowd of pedestrians on the city's famous Las Ramblas boulevard on August 17, 2017. Police were clearing the area after the incident, which has left a number of people injured. Children, some in tears, are escorted down a road in Barcelona, Spain, Thursday, Aug. 17, 2017. Police in Barcelona say a white van has mounted a sidewalk, struck several people in the city's Las Ramblas district. Mossos d'Esquadra Police officers and emergency service workers move an injured man, after a van crashes into pedestrians in Las Ramblas, downtown Barcelona, Spain, 17 August 2017. According to initial reports a van crashed into a crowd in Barcelona's famous Placa Catalunya square at Las Ramblas area injuring several. Local media report the van driver ran away, metro and train stations were closed. The number of people injured and the reasons behind the incident are not yet known. Official sources have not confirmed that the incident is a terrorist attack. Mossos d'Esquadra Police officers attend injured people after a van crashed into pedestrians in Las Ramblas, downtown Barcelona, Spain, 17 August 2017. According to initial reports a van crashed into a crowd in Barcelona's famous Placa Catalunya square at Las Ramblas area injuring several. Local media report the van driver ran away, metro and train stations were closed. The number of people i njured and the reasons behind the incident are not yet known. Official sources have not confirmed that the incident is a terrorist attack. Injured people react after a van crashed into pedestrians in Las Ramblas, downtown Barcelona, Spain, 17 August 2017. According to initial reports a van crashed into a crowd in Barcelona's famous Placa Catalunya square at Las Ramblas area injuring several. Local media report the van driver ran away, metro and train stations were closed. The number of people injured and the reasons behind the incident are not yet known. Official sources have not confirmed that the incident is a terrorist attack. A police offic er cordon off a street in Barcelona, Spain, Thursday, Aug. 17, 2017. Police in the northern Spanish city of Barcelona say a white van has jumped the sidewalk in the city's historic Las Ramblas district, injuring several people. 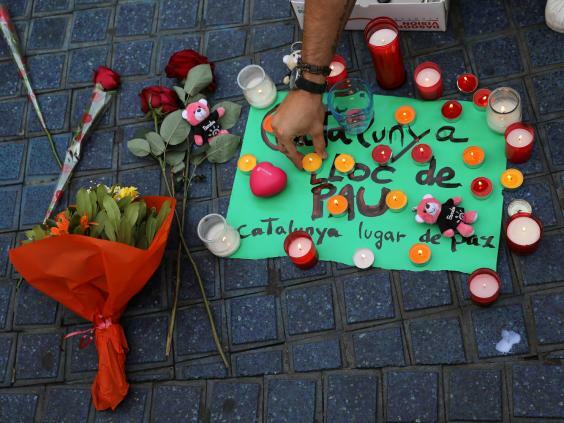 The King of Spain and Prime Minister Mariano Rajoy were among thousands who crammed into the iconic PlaÃ§a de Catalunya to observe a minuteâs silence. It was followed by sustained applause that has become customary as a sign of respect following terror attacks across Europe, before crowds burst into spontaneous chants of âNo tinc por!â, meaning âwe are not afraidâ. Barriers are being installed around pedestrian areas in Madrid and other major cities and tourist attractions, and the government held emergency meetings. Mr Rajoy said all of Spain's political parties were uniting to combat terrorism and will âhave the same attitude of victory towards vanquishing terrorism...we have had enough attacksâ. He said the âglobal battleâ will be fought by all countries that defend democracy, freedom and human rights. Having declared three days of national mourning, the Prime Minister announced a meeting where the country's terror threat level will be assessed today. Donald Trump, Emmanuel Macron and Theresa May were among the world leaders offering support to Spain following Isis-related attacks that have killed 330 victims in western Europe since 2014. The Prime Minister said she had offered her âdeepest condolencesâ to her Spanish counterpart over the attack, which injured several British tourists. She said: âThe UK stands shoulder-to-shoulder with Spain in confronting and dealing with the evil of terrorism and I have offered any assistance that we can provide. We must work together if we are to confront this evil of terrorism and the perverted, extremist ideology which drives it." The brother of Moussa Oukabir claimed the teenager stole his identification documents, which were found in the van after the massacre, in order to hire the vehicle. Moussaâs social media accounts painted a picture of an action film buff and football fan prone to violent and extremist outbursts. During a question and answer session on a site where he went under the name âMoussa Street Boyâ two years ago, someone asked what he would do on his first day as king of the world. âKill the infidels and only leave Muslims that follow the religion,â Moussa replied, later naming a country he would never live in as the Catholic Vatican. Older brother Driss remains in custody after being stopped by authorities, who confirmed he has a criminal record and was imprisoned in Figueres until 2012. He is among four men aged 21, 27, 28 and 34 who have been arrested so far, one in Alcunar and three in Ripoll. Three are Moroccan nationals and one is a Spanish citizen from the coastal enclave of Melilla in North Africa, while none have a criminal background linked with terrorism. Catalan police are also investigating whether another car ramming incident in Barcelon a on Thursday, when a vehicle drove through a police checkpoint, is linked to the terror cell. When police officers intercepted it several miles down the road, a man was found stabbed to death inside and detectives suspect someone was attempting to move the body. A statement from Isis said the main attacks were carried out by âsoldiers of the Islamic Stateâ responding to calls to target countries in the US-led coalition bombing its territories in Syria and Iraq â" wording frequently used to described massacres inspired but not directed by its militants. After the Las Ramblas attack, an Audi car was ploughed into pedestrians walking along the seafront in the coastal town of Cambrils, before overturning in a dramatic crash. Footage showed one attacker appearing to taunt the officer and getting up before being shot, while making a hand symbol associated with jihadis. Fitzroy Davies, from Wolverhampton, compared the scene to âhorror filmâ and described the attacker behaving âlike somebody who was on drugsâ. A woman who was among seven people injured in the attack died of her injuries in hospital, bringing t he toll from both atrocities to 14, with American, Italian, Belgian and Spanish victims so far named among the dead. The atrocities followed guidance issued by Isis on what it calls âjust terror tacticsâ, advising followers to hire lorries and other large vehicles to run over victims in crowded public places. Updated orders issued earlier this year urged attackers to have a secondary weapon in the vehicle like a gun, knife or explosives to continue the massacre after crashing, and included instructions on how to make incendiary devices. The advice has been echoed in the attacks in Nice, Berlin, Westminster and London Bridge. A foiled plot in Paris last year saw Isis supporters load a car with gas canisters, while a man died in June after ramming a car full of explosives into police on Parisâ Champs-Elysees, and a lorry attacker in Stockholm had put an explosive device in the front seat that failed to properly explode on impact.